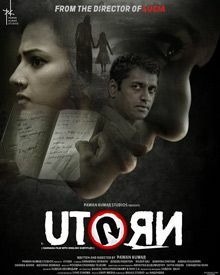 For people who are unaware, U-turn is a Pavan Kumar directed Kannada movie with English titles and subtitles. Well, that was a spoiler, I understand completely! Pun apart, it didn’t feel like I was watching a Kannada movie, though; since it has more English than needed. The director hasn’t let his grip loose anywhere which is a huge plus for the movie. Shraddha Srinath as an internist in Indian Express and Roger Narayan as the Sub-Inspector are the prime catch in the movie. Roger Narayan has in fact raised the hopes of the audience a lot, and definitely, I will look forward to his movies now. Dilip Raj and Radhika Chetan impress the viewers with however smaller their casting is. The story is a simple one, but the credit goes to Pavan Kumar again, in how nice he has woven the parallel scenes and put it all together in a rather curious way. But after half an hour of the movie, you can actually guess what is happening, and the events that you imagined unveils to be on screen. To be true, it doesn’t bore you anywhere at all and keeps you pinned to your seat. It is an eye-opener for many thousands everyday, who jump signals or take U-turns where you are not supposed to. In a touchy story, the director shows you the possible effects of over-riding the traffic rules. It can be watched by any non-Kannadiga owing to the amount of English and its subtitles. The movie is seemed to be made for non-Kannadigas or at least people who are here and cannot understand Kannada sufficiently. A must watch for all Bangaloreans, I repeat. Pick up courage and a few seconds of your precious busy time to warn the fellow peer bikers and drivers on the road if they are over-riding traffic rules. A simple signal jump can be disastrous if another person signal jumps from the unexpected corner. Take care of your lives while on the road, and care, for silly deeds can cost others’ lives too. That’s what the movie is about. In a thrilling way, though. P.S: I didn’t feel this movie requires a Kannada review J Hence, it’s all English.